Digitization of Human Resources is a hot topic these days. What do companies expect out of it? Optimization of processes, gains in efficiency and speed, and ultimately a modernized HR function. But will digitizing old processes be enough? Today companies face new challenges in the way they approach employee recruitment, retention and engagement. New digital consumer practices overlap into enterprise and lead to changing employee expectations, in particular with regard to the digital environment. Will HR lead these new challenges or will it be left out? Historically, the HR function was created to handle employee administration. HR professionals took care of legal compliance, the hassle of recruiting, processing, onboarding, evaluating, compensating and firing employees. A good HR professional was in essence a specialized accountant with a sprinkling of legal skills, defining and managing 30 or so separate processes related tothe life of an average employee within a company. That history is partly responsible for the bad reputation that the HR function faces today. In a job market centered on the company rather than the employee, HR was identified as the big brother voice rather than the employee’s friend. HR professionals would screen the candidates to make sure they could be molded into the company culture; they would carry out mass redundancies and close factories they would be the force to beat for any career advancement; they would always cheat you out of a bonus based on some compensation grid and so on and so forth. Will HR digitisation be the death of HR? In most countries, legal compliance is so complex and ever-changing that employee administration still accounts for most of the HR function’s daily work. 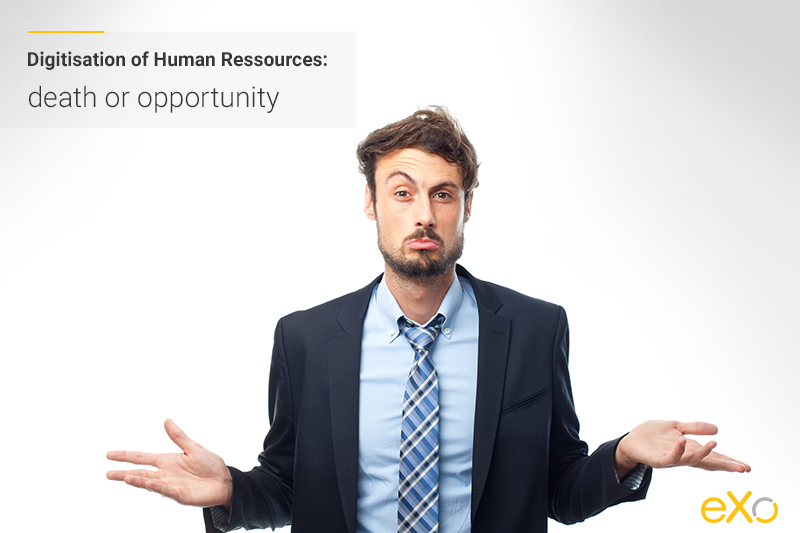 As a result, HR processes were among the first to be digitized and outsourced. In North America and Western Europe today, at least 30% of companies already outsource their payroll management and the trend is growing. In Belgium outsourcing reaches 90%. Today, hundreds of new collaboration software providers reinvent HR processes with groundbreaking solutions. We can mention Clustree for instance, a solution integrating artificial intelligence into HR data treatment, Assessfirst in the predictive recruiting, Talentsoft offering a stack of talent management tools or Workday with its SaaS payroll solution. In that context, do we still need a separate function for employee management? With process digitization and outsourcing, can the employee not be managed directly by his or her business unit with the help of inance and IT? Today’s demographic contributes to a very tense talent market. Indeed, as baby boomers approach retirement age, they need to be replaced. But in most countries the next generation (Generation X) is only half the size of the baby boom generation, creating a gap between supply and demand. Besides, the economy is increasingly global and talent increasingly mobile. Before, HR departments were competing only with their local peers. Today, that competition transcends all frontiers, introducing new demands on company branding strategies. Millennials’ (or Generation Y’s) arrival on the job market is another challenge that the HR department needs to handle. Millennials represent the majority of the workforce today, and will compose around 75% of the workforce by 2030. Millennials’ expectations of the workplace appear to be quite different from the older generations. Things such as mobility, remote work, flexible hours, search for meaning and personal development weigh more and more in their choice of job. Along with the importance of individual development, employees also expect more from their company in terms of community. As historical communities – the village – disappear, people tend to search for digital communities, in particular in their workplace. Today most companies need to deal with massive employee disengagement, resulting partly from a mismatch between the processes in place and employee expectations. But while engagement plummets, it also becomes the greatest performance differentiator. In a context of rare talent and global competition, business winners of tomorrow will undoubtedly be those companies who harness their employee engagement. “While our projects focus on the digital workplace and employee experience, we rarely see HR own the digital transformation initiative. We work more with other members of the C-suite – CIOs, CEOs, internal communications…” – B. Mestrallet, CEO and founder of eXo Platform. In recent years, digitization has deeply transformed the way companies operate. But in all digital transformation projects, the human component is the key to success. From this point of view, digitalization represents a unique opportunity for the HR function to reinvent itself in a more strategic role. Employee experience – who is in charge? In order to face the challenge of recruiting, growing and retaining talent, companies need to reinvent the entire employee experience. As with customer experience, someone needs to look at things from the employee’s perspective at each step of the employee’s journey with the company. And while this seems logical, nobody really does that today. Business functions look at the employee as an asset for a particular job. The IT function is concerned with how the digital systems will be managed and maintained and how much this will cost. The internal communications function is concerned with how efficiently it can push messages to the employees. The finance function is concerned with money and insurance. Even the HR function is often primarily concerned with how it will operate the process as opposed to how an employee will live that process. All of the above is particularly true in the context of digitization and digital transformation. Every business function is focused on digitizing its business processes, without taking into account the whole of the employee digital experience. As a result, employee needs are not met and digital transformation projects fail. Employee experience has no identified champion within the organizations, which represents the perfect and natural opportunity for HR to fill this void and claim ownership of the employee experience and its digital aspects. Given the strategic importance of the challenge, this alone would justify HR having a strategic role in the C-suite. HR can also help with change management in relation to digital or organizational transformation projects. HR can partner with operational managers and build on their expertise in employee management. How to onboard older generations into digital processes, how to satisfy Millennials’ needs, how to capture and transfer expertise… all are relevant issues where HR can play a decisive role. HR can also bring value through internal communities management. Internal communities represent an underexploited strategic value for the company. They help capture and transfer knowledge, grow company culture, help with employee engagement and satisfaction. As with external communities, they need to be identified and then nurtured in order to grow and thrive. Here also, the HR function has a role to play. Digitization of HR processes is well underway, but digitizing an old process is hardly revolutionary. Rather, the HR function is expected to take a lead role in the company’s digital transformation and defining the digital employee experience. HR professionals need to become marketeers, community managers, and change managers….or disappear. I collaborated on this post with our digital collaboration consultant, Morgan Argondicco. I hope you have found it interesting. We always look for new ideas and feedback! Leave us a comment. If companies want to appear appealing to job seekers, the HR has to adopt digitization, simply because there are big names in the market, which have already done so. Digitization doesn’t necessarily always mean something drastic. A company will appear more efficient and productive through such technologies and will also attract the best talent.